Aventuras Mayas, the leading tour operator in Mexico’s Riviera Maya, has announced the opening of Hacienda Chukum, a new adventure travel destination near Valladolid, Yucatán with a 130-foot cenote named Chukum-Ha. Named after the surrounding chukum trees indigenous to the area, the park features a number of adrenaline-filled activities for visitors, an open-air restaurant with local Yucatán cuisine, and a gift shop full of locally sourced artwork and souvenirs. The newly developed hacienda will serve as a must-see stop for travelers either visiting the charming colonial town of Valladolid, or on their way to the Mayan ruins of Chichen Itzá and Ek-Balam from nearby vacation destinations like Cancun or Playa del Carmen. Hacienda Chukum is open every day from 9 a.m. to 5 p.m., with day passes priced at $10 for adults and $5 for children ages 5 to 11. 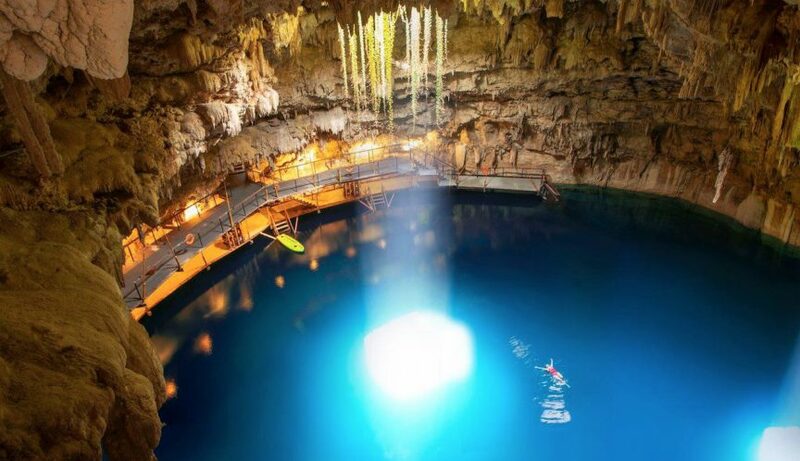 Day passes include parking, access to the Chukum-Ha cenote, life jackets, and a locker. A rappelling experience from the top to the bottom of the cenote is optional at an extra cost of $5 per person. A full day pass for $25 per person includes a buffet meal of local delicacies. Hacienda Chukum is also available for buyouts for private meetings, weddings and events. Its outdoor pavilion features vaulted, thatched ceilings and can host up to 300 seated guests.